Nottingham Trent University introduced its Award for Outstanding Alumni in 2007. The award recognises the vital role former students play in raising the University's profile through their distinctive attainments, professional success and contributions to society. 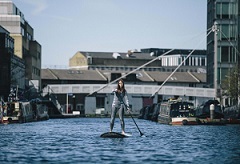 In May 2016, Lizzie Carr – also known as Lizzie Outside – became the first person to paddleboard the length of England’s connected waterways. Alone and unsupported, she completed the 400-mile journey in 22 days, plotting over 2,000 photos of the plastic pollution she encountered. One year on, Lizzie became the first woman to stand-up paddleboard across the English Channel solo. Her record-breaking crossing took seven hours, and drew attention to the bigger story of plastic pollution in our oceans. Her social media channels feature photos and videos from her adventures, keeping her followers up to date with every challenge she undertakes. In July 2018 Lizzie launched #PlasticPatrol – a nationwide campaign to rid our waterways of plastic pollution. Around 80% of marine debris comes from inland sources, so her mission is to combat the global plastic crisis by stopping the problem at its source in the canals and rivers she knows so well. 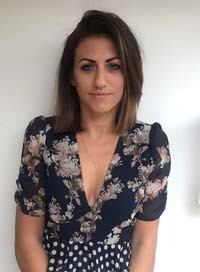 After graduation Beth secured work at a fashion industry start-up, and thanks to the practical and creative skills developed on her course, she was able to help it grow into a successful business. Bolstered by this experience of running a small company, Beth identified a gap in the market for beautifully designed occasionwear at affordable prices, and set up the fashion label Hope and Ivy with her business partner Sarah Sleightholm. Determined to expand, Beth and Sarah applied to Dragon’s Den and pitched their idea for an e-commerce site. They left the Den with £78,000 and the backing of “Dragons” Deborah Meaden and Peter Jones. Today Hope and Ivy products are sold all over the world by large fashion retailers and independent boutiques. In just three years, their annual turnover has surpassed an impressive £2 million. Umamaheshwaran Panneerselvam (MRes Applied Biosciences 2010) risked his life to save more than 500 lives across the city of Chennai and provided food and shelter to more than 3,000 people, after heavy flooding hit the area in 2015. Chennai was submerged in high levels of water during the floods of 2015 and official help from the state government and the army was delayed for weeks. Umamaheshwaran and his friends decided to take action and set up a ‘help hub’ in his home. Using social media they organised a rescue team consisting of swimmers and fishermen. The rescue team collected food and water from all over India and they swam across the water-clogged rivers to distribute it. They moved disabled children, the elderly and hospital patients and liaised with other cities to find medical supplies. With the help of local community leaders and businessmen, Umamaheshwaran arranged shelters for all over Tamil Nadu and relocated those affected by the floods. 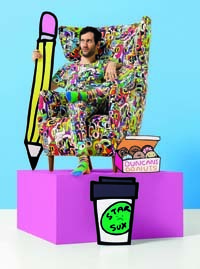 Jon Burgerman (BA Hons Fine Art 2001) is a global leader in the popular 'doodle' art style. Known for his instantly recognisable pop-art cartoon aesthetic, his works exist across a multitude of forms including canvases, large-scale murals, sculpture, toys, colouring books and more. His work is exhibited internationally and features in the permanent collections of the Victoria and Albert Museum (V&A) and Science Museum, London. In 2008 Jon first entered the public consciousness when his 300 page monograph - Pens Are My Friends - was published by IdN. In the same year he appeared on BBC TV show Blue Peter to create a mural 'doodle' live on set. He has won awards and collaborated with numerous global household brands that include Samsung, Pepsi, CocaCola, Nike, Sony, Sky, BBC and more. In 2010, he relocated to New York to develop his practice and in 2015 he exhibited work in the White House. Today Jon regularly performs at events, conferences and universities internationally, delivering keynote lectures and running creative workshops. 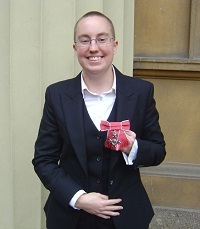 Emily received an MBE in 2014 for her work as chair of the Devon and Cornwall Gay Police Association (GPA). This involved leading ground-breaking activities to improve equal opportunities within the service as well as instigating the Visible and Everywhere campaign to tackle isolation of lesbian, gay, bisexual and transgender colleagues. Emily, who was chair of the Devon and Cornwall GPA for six years, held several roles within criminal justice until 2013. These included engagement and volunteers officer for the Office of Police and Crime Commissioner for Devon and Cornwall; community engagement lead for the Devon and Cornwall Police Authority; and community justice business analyst for the Devon and Cornwall Criminal Justice Board. Emily was involved with the LGBT Society during her time at NTU and continues to work with the University to engage students in relation to LGBT issues and to support course curriculum development within the School of Social Sciences. Emily, who is currently senior supervisor for operations at Exeter Library, said: "I am thrilled and shocked to hear I am the 2015 Alumna of the Year. There are so many successful people that have graduated from NTU that are making a difference in our world and I feel humbled to be considered worthy of such an award. "My time at University was hugely important to me and very formative. Beyond the academic, being involved in societies and feeling like part of a huge community was an experience that I will forever hold close to my heart." Amerdeep Somal was the first woman from her family to go to university, determined to pursue her dream of becoming a lawyer despite what cultural expectations dictated for her. 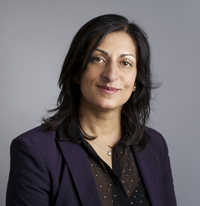 After graduating, Amerdeep worked in private practice and then the Crown Prosecution Service, before moving to the Independent Police Complaints Commission (IPCC) for ten years as a commissioner and taking a lead on gender abuse and domestic violence. Amerdeep Somal is currently the independent assessor to the board of the Financial Ombudsman Service (FOS). Joe Sargison (PGCE 2004) set up Balls to Poverty in 2004 following a trip to Johannesburg, where he found a group of township children playing football with a bunch of rags. He gave them a football and was astounded by the effect such a simple gesture had on them. Now, almost ten years later, Balls to Poverty has raised more than £275,000, held 800 education workshops for South African and Ugandan coaches, and handed out more than 28,000 footballs and rugby balls to South African and Ugandan children. It has won praise for the way it has used sport to help steer youngsters away from crime and drug abuse and also offers regular coaching for more than 20,000 children in Nottingham. He added: "It's great to be recognised by Nottingham Trent University where my teaching career began”. Giving up a full time job, fundraiser Matt Wallace set out in September 2011 and walked over 1,500 miles from John O'Groats to Land's End via 16 cancer research centres. So far he has raised almost £25,000 for Cancer Research UK. During his Where's Wallace? journey he walked around 16 miles a day for six months, visiting all of Cancer Research UK's dedicated research centres along the way where he filmed a series of short videos about the work undertaken at each one. After completing his journey, Matt was invited to take part in lighting a beacon at Scafell Pike for the Queen's Diamond Jubilee, and also received the Cancer Research Flame of Hope Award for Innovation. Matt has been an outstanding ambassador for NTU since his graduation in 2002. He was President of the NTU Students' Union, and later joined NTU as Student Communications Officer, then Press Officer. He gave up his job on his 30th birthday to undertake his ambitious task. Matt said: "NTU graduates take away much more than an academic qualification when they leave. I know that I became the sum of all my experiences along the way. I'm everything that the university helped me to learn inside and outside of the lecture theatre and I'm every opportunity I took to try something new. I'm very lucky to have witnessed tens of thousands more students graduate, each one as proud as me to be an alumnus." Baz is the Assistant Chief of the Air Staff for the RAF. He joined the RAF in January 1982. Highlights of his outstanding 30-year service include commanding the UK response to the flood relief operation in Mozambique, working with the Chief of Defence staff during the break-up of the Soviet Union, acting as Aide-de-Camp to the Queen and flying with the Red Arrows as their Air Officer Commanding. Baz's service has gained him the MBE and OBE, and he has also received a Queen's Commendation for Valuable Service in the 2006 Operational Honours List following his last overseas post commanding all UK air operations in the Middle East, the Horn of Africa, Iraq and Afghanistan. Now based at the Ministry of Defence, he delivers air policy advice to the Secretary of State, and coordinates the RAF's implementation of the changes falling from the Strategic Defence and Security Review and the Comprehensive Spending Review. Baz said: "When I left in 1981, I never imagined that I might be considered for such recognition in future. Receipt of this magnificent award serves to demonstrate to current and future students how they too can capitalise throughout their life on the grounding that they receive at Nottingham Trent University." Note: In April 2013 Baz was promoted to Air Marshal and became the Air Member for Personnel and Capability. He received the Knight Commander of the Order of the Bath (KCB) in the 2015 New Year's Honours List. Paul joined the BBC as a producer in local radio and went on to be a political reporter for BBC TV in Southampton. He was eventually given his own investigative series on BBC1 called Kenyon Confronts and had his first experience with Panorama in 1999. Since then Paul's had some extraordinary experiences – being shot at in a military helicopter whilst investigating drug cartels in Colombia; exposing child labour in garment factories in Cambodia; he's even faked his own death and funeral in Haiti to expose a gang of fraudsters. Paul said: "I am extremely touched to be given this award. Nottingham Trent University was inspirational to me. It encouraged me to think freely and creatively and to constantly question authority - all valuable qualities for a journalist. Some of the books I had to read in Nottingham 25 years ago I still re-read today, taking them around the world and always finding something fresh and insightful. I've been fortunate in arriving at a career I love and I have to thank Nottingham Trent University for helping me get here." Note: Paul won a BAFTA in 2012 for his panorama Undercover Care: The Abuse Exposed. Since taking on the role of Lead Coach for the British Para-Cycling Squad in 2006, Chris Furber has led the team through three World Championships and a Paralympic Games, earning an incredible 50 gold medals along the way - including 17 golds and three silver at the 2008 Beijing Paralympics. Chris said: "I'm really very lucky to be working in a job that I love and that I'm very passionate about. My time at Nottingham Trent University set me on a path to playing a part in the success that British Para-Cycling has earned in the past few years. 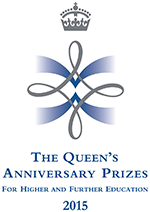 To be recognised for these achievements by the University is a real honour." Note: In May 2013 Chris was appointed the National Performance Director - Para-Swimming. Race for Life, the annual women-only 5k run in which thousands of participants raise millions for Cancer Research UK, wouldn't be what it is today without Louise Thomas (formerly known as Louise Holland). With her help and inspiration it is estimated that, since it began, Race for Life has raised over £300 million to support pioneering work in the fight against cancer. Louise said: "I feel honoured, excited and privileged to receive this award - especially as it's all come about because I'm simply doing a job I love." Celebrated artist and 2005 Turner Prize winner, Simon has made his name as an artist fascinated by the processes involved in transforming one object or substance into another. In solo exhibitions worldwide, he has showcased installations and pilgrimage-like journeys highlighting ideas about nature, technology, economics, modernity and mass production. Simon said: "Winning the award was complete surprise, but a very welcome one. I have been living outside Britain for some years now and it came as a bit of a shock that I was still on the map in Nottingham. I feel I was lucky to be part of an interesting group of people who studied photography there in the late 1980s."